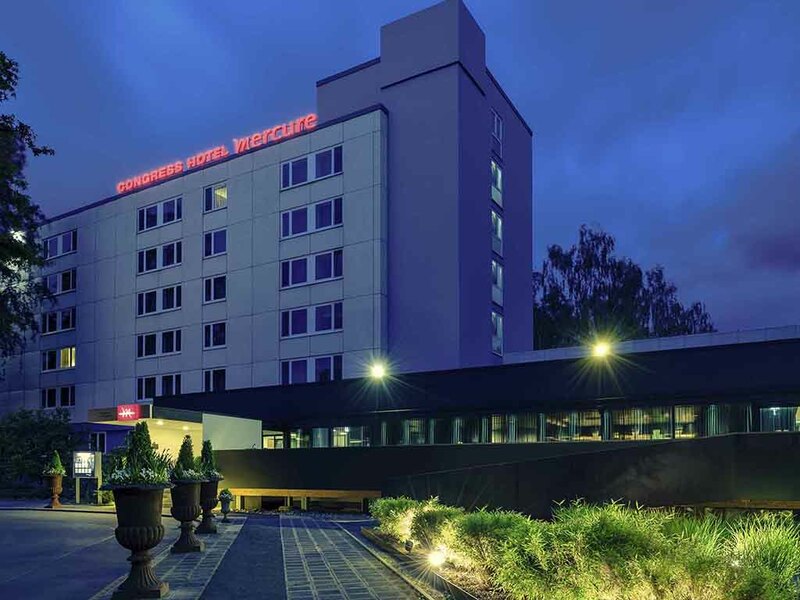 The Congress Hotel Mercure Nürnberg an der Messe is just a short walk from the exhibition center. The hotel offers 140 rooms with air conditioning and free WIFI as well as a sauna and fitness area. For your events for up to 200 people, the hotel has six quiet meeting rooms facing the park. The hotel is 1.9 miles (3 km) from the main train station and 7.5 miles (12 km) from the airport. The nearest highways are the A3, A6, A9 and A73 and the hotel offers parking. Travel to the city in 10 minutes by U-Bahn. Since the exhibition grounds opened in 1974, NürnbergMesse has become one of the 20 largest exhibition companies in the world. Today it holds around 120 trade fairs and congresses in Nuremberg and worldwide, with around 24,500 exhibitors. At the Congress Hotel Mercure Nürnberg an der Messe, you can choose between Standard, Privilege and Superior Rooms and a Junior Suite. All 140 rooms in our hotel are air conditioned and have WIFI and a DSL connection. Two children aged up to 16 can stay overnight free of charge in your room. Your pet is welcome (for a charge of EUR 10/night). Our laundry service will take perfect care of your clothing and laundry for a fee. Indulge in the international cuisine served in our contemporary restaurant, Tangram. Delight your palate with our exquisite dishes while enjoying the view from our terrace. We are open daily from 6.30am to 11pm. The hotel's "Black Bar & Lounge" has enough room for up to 30 guests. Come and have a drink and if the weather is nice, why not find a cozy spot on the terrace. The bar is open from 5pm-2am. We look forward to your visit. Wonderful atmosphere with great staff members who cared about our satisfaction. My family and i stayed for 1 night. The staff members answered all of my questions and made me feel welcomed. Our group enjoyed our stay. The food was good and the bar area was convenient for such a large group of us. I reserved through Monika who was a great help from beginning to end. Since this is a Messe Conference center - related hotel, I would recommend having a shuttle in the morning and evenings for guests to conveniently get to the conference place. Love staying at the Mercure hotel. Close to the fair and very nice hotel, great staff and beautiful surrundings. only two issues, the shampoo was never replaced after the first one was used! the towels are so thin they are like using sand paper!! when you are charging me €400 at peak then a decent towel and quality shampoo is at least I would expect. It's always a pleasant stay at this hotel. Reception staff are very helpful. Rooms are always good. Bar is good - food is excellent. Good hearty breakfast, friendly waitresses, no shortage of what was on offer. Rooms were comfortable and clean, the bed was just right - only the pillow was a bit hard. The reception and bar staff were friendly and more than helpful ... l will use this hotel again. Overall my stay at the Mercure hotel is good. Everything fulfilled my expectations. Despite I need to pay more during the exhibition time which took place at the Nuremberg Messezentrum, I think it is worth it. I don't use the whole facilities, but I can enjoy the beautiful scenery of the park behind the hotel. Business stay, good breakfast, clean rooms, nice bathroom. The provided service was good. The rooms were smaller than expected. One of our employees had to change from a double bed room to a room mit two single beds. Besides that it was a good stay and we had nothing to complain. Stayed in Many Mercure but they are not the same. For this Mercure the room was very silent also. I like that, but thier airco system is really bad. It does not cool as it suppose to be And makes allot of noise. I found the pillow very flat And i even woke up with a stift neck. We had a great stay and the accommodations was a plus. The location was great with a short commute to the city center. Very nice personnel, clean room, lounge very cozy, kitchen personnel was flexible and food was tasty, breakfast very rich and fresh. Only one suggestion: several signs on the street, to the hotel, at least from the subway station would be helpful. break first is very good.